Do you also want to make something happen and become part of the Lekkerland team? We may have a suitable position for you! 4,800 Lekkerland employees in six countries with a common objective: to make our customers successful using our products, services and bespoke solutions. Jobs within the Lekkerland Group are as diverse as the people who work with us. It doesn’t matter whether they are drivers, route planners, IT experts, lawyers, order pickers or purchasers: we want to be “Your most convenient partner” for our customers! Who better to tell you about working at Lekkerland than our employees themselves? Read their own experiences of how they support our customers and what is special about “Team Lekkerland” for our employees. Do you also want to make something happen and become part of the Lekkerland team? We may have a suitable position for you here! 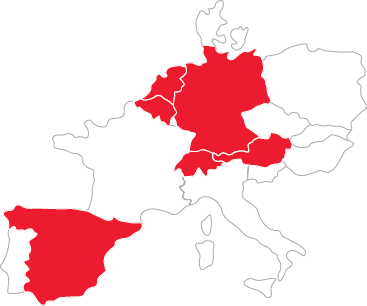 In our job section you will find our vacancies in Germany. You can search for suitable vacancies through various filter functions or directly via a search word. In our job section you will find our vacancies in Austria. You can search for suitable vacancies through various filter functions or directly via a search word. In our job section you will find our vacancies in Switzerland. You can search for suitable vacancies through various filter functions or directly via a search word. In our job section you will find our vacancies in the Netherlands. You can search for suitable vacancies through various filter functions or directly via a search word. In our job section you will find our vacancies in Belgium. You can search for suitable vacancies through various filter functions or directly via a search word. In our job section you will find our vacancies in Spain. You can search for suitable vacancies through various filter functions or directly via a search word.